Taipei is one of Asia’s best-kept secrets. From street foods to Michelin-starred restaurants, the city is jam-packed with a wealth of culinary options, stunning natural scenery, friendly locals – and excellent value to boot. And considering that the flight from Hong Kong to Taipei is over before you can catch the end of Life of Pi, you don’t really need an excuse to visit. Here are our top tips for spending a perfect weekend in the Taiwanese capital. From shopping to hiking there are plenty of things to do in Taipei. Check in at the city’s most established international luxury hotel, Grand Hyatt Taipei – recently hailed as one of the top 10 hotels in Asia by Condé Nast Traveler. Opened in 1990, the property still delivers top-notch service and style. Thanks to a landmark renovation in 2014 that saw all of the 850 guestrooms and suites stripped back to its concrete beginnings, redesigned and rebuilt. Located in the heart of Taipei’s main commercial and shopping district, Xinyi, the hotel is just a stone’s throw from a wealth of popular eateries and bars, shopping arcades and cultural attractions. Opt for one of the apartment-sized Grand Executive View Suites for panoramic views across the city and of Taipei 101 – the skyscraper that was, until 2010, the world’s tallest. There are eight restaurants on property, ranging from Italian and Japanese to contemporary Chinese fare. The European steakhouse Bel Air is our pick for a romantic date although the seafood buffet in the casual Café is hard to pass up. Round off the ultimate city break with champagne cocktails and live music at Ziga Zaga. Or get your tan on at the stunning outdoor Oasis swimming pool. Often ranked as one of the best food destinations in the world, Taiwan’s culinary philosophy can be best described as eat often and eat well. No visit to Taipei is complete without a visit to the original Din Tai Fung on Xinyi Road for their world-famous xiaolongbao. The soup dumplings have earned the Taiwanese chain a Michelin star in Hong Kong and a “top-notch table” designation from The New York Times. Be sure to get there early though as the restaurant doesn’t take reservations and it can often take a while to get seated. After lunch, amble down neighbouring Yung Kang Street. Packed full of tea houses, cute cafés and roadside vendors selling steaming bowls of beef noodle soup, this bustling street and its surrounding alleyways is a mecca for foodies. Indulge in a mango shaved ice dessert from Smoothie House. Get your caffeine fix with a bubble milk tea from Yi Pin. Or buy some Oolong tea to take home from Yoshan Tea. For Chinese fine-dining, look no further than Yun Jin at Grand Hyatt Taipei. This elegant restaurant with its plush velvet chairs and silk embroidered walls, specialises in regional Chinese delicacies from Sichuan, Hunan, Shanghai, Hangzhou and Taiwan. The menu here is extensive, encompassing everything from barbecued meats, soup, seafood and delicious clay pot dishes. Try the mouthwatering fish dumplings and be sure to pre-order the roasted duck. Fifty years of Japanese rule left Taiwan with a taste for raw seafood, so if you’ve had your fill of Chinese food for the day, check out Addiction Aquatic Development – a live seafood market, gourmet grocery, sushi bar, hotpot and grill restaurant all rolled into one sleek complex. The stand-up sushi bar doesn’t take reservations, so grab a drink at the wine bar and ogle the vibrant space while you wait your turn. A visit to Chiang Kai-shek Memorial Hall is a must to understand the culture and colourful history of Taiwan. Surrounded by a gorgeous park, which is also home to the National Theater and National Concert Hall, the memorial hall was built in memory of Chiang Kai-shek, the first president of the Republic of China. An enormous bronze sculpture of the late leader adorns the white marbled hall where visitors can watch the hourly changing of the guard. From here, it’s a quick cab ride to Longshan Temple in Wanhua district for a glimpse into Taiwan’s folk faith and unique temple architecture. Founded in 1738 by Han immigrants from Fujian, Longshan has served as a municipal guild and self-defence centre, as well as a house of worship. 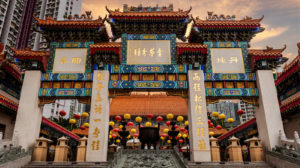 These days the temple is regarded as one of the island’s top religious sites and includes halls and altars to Buddhist and Taoist deities such as Mazu, the Goddess of the Sea, and Guan Yu, the God of war. The best times to visit are 6am, 8am and 5pm when crowds of worshippers gather and engage in hypnotic chanting. Lovers of beautiful relics should make a beeline for the extraordinary National Palace Museum, home to almost all of China’s imperial treasures, which were spirited away from Beijing’s Forbidden City by Chiang Kai-shek when he set up government in Taiwan during the Chinese Civil War. For some retail therapy, look no further than Taipei 101. The iconic tower and mall, which is connected to Grand Hyatt Taipei via an outdoor sky bridge, boasts an enviable selection of international designer brands and is open until 10pm. Once you’ve maxed out your credit card, take the world’s fastest elevator to the observation deck, located on the 89th floor, for breathtaking views of the Taipei skyline and beyond. If shopping malls aren’t your bag, hop on a YouBike (Taipei’s public bicycle sharing service) and pedal over to Songshan Cultural & Creative Park. Located on the grounds of a former tobacco factory, the remodelled warehouses now hold live music performances and art exhibitions. As well as quaint shops selling trinkets and Taiwanese-designed products. Right beside the creative park is Eslite, Taipei’s popular lifestyle and bookstore. This is well worth a browse, particularly for its glass blowing, pottery and jewellery-making workshops. You’d be forgiven for thinking that Taipei’s attractions are only confined within the urbanity. Take a break from the metropolis and hike Elephant Mountain – one of the capital’s most popular hiking trails. The majority of hikers are able to reach the top in around 20 minutes. And are rewarded with sweeping, unobstructed views of the entire city. Tired and cranky after your flight? Skip happy hour and visit the Oasis Spa at Grand Hyatt Taipei instead. Perfect for detoxifying post-travel, the spa’s 180-minute “Calm” signature experience uses moor mud from Hungary’s Heviz Lake, the largest mineral lake in the world. The treatment includes a therapeutic “moor mud” body wrap to promote circulation and release toxins, a Swedish-style deep tissue massage to knead away aches and pains, followed by a moisturizing “moor mud” mask to lift, firm and hydrate the skin. Pure bliss. Although Taipei has no shortage of fine-dining restaurants, perhaps the most authentic Taiwanese food can be found at the city’s many night markets. Skip the overly touristy Shilin Night Market and by all means avoid the claustrophobic Raohe Street. Instead, check out Tonghua Night Market (also know as Linjiang). Located just a short walk from Grand Hyatt Taipei, this is one of the capital’s liveliest night markets and all the better for being more local. Here you’ll find dozens of stalls selling popular Taiwanese delights such as fried pork buns, stinky tofu, beef noodle soup and ice-cream roll with peanut brittle and coriander. Next, head over to BS Mini on Xinyi Road for a nightcap. Hidden behind a secret door, this Prohibition-style speakeasy specialises in handcrafted cocktails. Still not ready to call it a night? End the evening dancing your socks off at Taipei’s best hip hop club, Chess. If your head begins to throb before you’ve even made it back to the hotel, there’s always the option to refuel with another bowl of beef noodles at Tonghua Night Market. After all, it’s open till 2am!